Make Working Dollhouse or Miniature Scale Pencils and Colored Pencils. Make tiny working dollhouse and miniature pencils and colored pencils in several styles and colors These are much more realistic than the simplified versions made from painted toothpicks. There is no carving involved, and you can make them in colors as well as regular graphite black. These are a good project for a club. If you don't have the necessary materials, the pencils can be made in a non functioning format by using painted wire as the base for the pencil shape. The working pencils are delicate, but easy to sharpen, so have some fun and amaze your friends. If you want, you can combine pencils with a quill pen desk set. Fine Detail Brush for paint. Fine Sandpaper - I use 240 grit or finer. Fine, Bent Nose Tweezers To hold your tiny pencils while you complete them. Dry Florist's Foam or styrofoam - to support the tiny pencils while the paint coating dries. Mechanical Pencil Graphite Leads or Colored Lead - You can buy colored leads for mechanical drawing pencils in many art stores in the drafting department. Choose a lead size that suits the scale of pencil you want to make. The ones in these instructions were standard fine writing size of .5mm. You can also find .3, .7, .9 and up usually from art stores which sell drafting supplies. Wire - If you want hardier, non writing pencils for displays, you can use the same technique on wire, I used 26 guage painted wire using a metal file instead of sandpaper to create the pencil point effect. Craft Knife or Scalpel Some of you may find it easier to sharpen your miniature pencils with a sharp scalpel or craft knife,or a carving knife. Pin Vise or Mini Drill - if you don't have a mechanical pencil you can use a pin vise or mini drill to hold the wire or pencil lead while you work. You can start creating your dollhouse or scale miniature pencils in a number of different ways. The method that works best for you will depend on how you are comfortable holding them, your paint, and the type of 'lead' you use. The method is easiest to use if you have a mechanical pencil with the lead loaded in. You can work on stages of your miniature pencil while the lead is held in the mechanical pencil. If you have lead only, you can use a slighly longer than required piece of led, and hold your miniature pencil while the paint dries, by inserting the unpainted extra bit into a scrap of dry florist's foam or styrofoam. You can also insert a length of lead into a miniature pin vise to work on it. For non working pencils made from wire, you have the option of painting them on a longer section of wire (easier to handle) and cutting them free later, or cutting sections, inserting them into a miniature pin vise and working with them as outlined for the working pencils. If you are making your pencils from sections of wire, make sure your wire is the appropriate guage for your scale (roughly #26 or # 24 guage for 1:24 pencils and up to #18 for 1:12 scale pencils). Working with wire it is easiest to sharpen the pencil 'end' first using a file. When the end is sharpened, paint it the color you want your pencil lead to be. For the 1:24 scale working pencils shown here I used colored and graphite mechanical pencil leads sized .5 mm which is a standard fine point writing size. The photo on this page shows sections of colored pencil lead painted where the 'wood' will be on the pencil point and held to dry in floral foam. For the method of making pencils using a mini drill or mechanical pencil, see the next page of the instructions. Start forming your working miniature pencil by carefully pushing out a section of lead from a mechanical pencil. Work out what length you want your pencil to be, and extrude this much lead from the end of the pencil. (I'll show a reverse method in case you prefer working that way in a later step). Tip Try one pencil with your lead using this method and if you have problems, try a different method. Strengthen the Pencil Lead - Some of you won't need to do this, but some types of mechanical pencil leads can be very brittle. If you have a lead which breaks on you as you work, start your project by painting a very thin layer of pva glue over the length of your pencil lead. Set aside to dry. Paint the Wooden Tip on Your Pencil - When you have your length of lead extruded, use a fine brush to apply a thin layer of wood colored paint, applying the paint close to the end of your pencil (not the end of your lead) and drawing the paint back along the pencil to thin out the coat. Light, pinkish or ochre brown works well as a color (see photo). Make sure the paint is all around your lead at the end closest to your pencil in a very thin coat without blobs. (see photo). Leave the lead sticking out of the pencil and allow the paint to dry. To create an even paint coat on the sides of your miniature pencil, dip the lead carefully into a thin liquid acrylic paint, leaving a small amount of the 'wooden' tip you painted on the lead free of color close to the end of the mechanical pencil. If you do this without a mechanical pencil or miniature drill to hold the lead or wire, you will hold just the very tip of your lead, near where the pencil point will be with a pair of tweezers. When you have dipped your lead into the paint, pull it out and tap the lead gently on the sides of the paint container to even out the paint coat. You want to avoid large blobs. If you get a blob of paint, let it form on the end of the lead furthest from the mechanical pencil point, you can always cut the dried blob off the pencil end when you are finishing your scale pencil. If you can however, tap the lead against the paint bottle now to get excess paint off the sides of the lead. Take your fine paint brush and pull a tiny bit of the wet paint up over the edge of the painted wooden tip in a few places, to resemble the marks you see between a sharpened wooden pencil end and its painted coat. This is not essential! Leave your painted lead to dry held in the mechanical pencil or miniature drill. If you are doing bits of lead by hand, turn your pencil and insert the end where the point will be (or is) into a bit of florist's foam leaving your pencil body standing upright until the paint dries. (see photos in later steps). For colored pencils, if you are using a colored pencil lead, you can dip your lead in matte or semi gloss clear coating instead of colored paint to get a coating on your pencil that looks like paint which matches the lead color. If you do this, make sure the 'wood' paint is trimmed for just tip first so it doesn't show through the clear coat, and dip the lead into the clear coat only as far as the point where you trimmed the wood colored paint. To make a writing tip on your dollhouse miniature pencil, let a bit more lead out of the mechanical pencil tip so you can comfortably work on shaping the tip. Make sure all the paint is dry before you attempt this step. If you don't want to shape the tip with a knife, but are happier with sandpaper, extrude a bit more lead from your mechanical pencil or mini drill, then break the lead against the tip, leaving roughly 1/16 of an inch of lead without paint on the end of your miniature pencil. With the lead still held in your mechanical pencil, gently support the lead and use a sharp knife or blade to gently sharpen the tip of the pencil away from the point. Don't worry if the miniature pencil breaks free of the rest of your lead before you have it completely sharpened. The way you sharpen your miniature pencil will help create the illusion of a new or used pencil. New pencils have very gradual points. Used pencils have shorter points with less lead showing. To sharpen your miniature pencil without a knife, or to make a finer point on a partially sharpened pencil, hold your pencil gently in your fingers and run the tip across a piece of fine sandpaper on a sanding block. Keep the tip of the pencil at the same angle as you work your way around the pencil. Take care to not sand off the paint which resembles wood. Method two to try for making your miniature pencils starts by making the sharp end first. You can do this with a piece of lead in a mechanical pencil or pin vise, or hand held. The same method is used to make not working pencils made from wire. For lead held in a mechanical pencil, extrude a short bit of lead as if you were going to write, and sharpen it by rubbing it at an angle against a sanding block with fine sandpaper. Use a fine file if your pencil is going to be made from a section of wire. When you have filed or sanded a sharp point on your pencil lead, or wire, paint the point to the correct lead color if it is made from wire. Add a tiny section of 'wood' by painting a bit of brown just back from the point of your miniature pencil. Allow this paint to dry. Extrude a full length of lead, enough to make the rest of your pencil, or measure and cut your pencil lead to length once the paint is dry. Cut your wire to the length you want your pencil after the tip and 'wood' paint are dry. When you have cut your lead or wire to length, and your paint is thoroughly dry, hold the tip of your pencil with tweezers and dip it into your paint coat, keeping the tip (which is held in the tweezers) free of paint and leaving a bit of the 'wood' paint showing. Hold the pencil until it is dry, or hold it above some florist's foam or styrofoam, and press gently onto the flat end of your pencil, pressing it into the florists foam without touching the painted sides. Leave to dry. You can make a range of styes of miniature pencils by adapting these base instructions slightly. Miniature Carpenter's Pencils - to make carpenter's pencils, dip the lead repeatedly in paint to make a thicker pencil. You can also mix matte acrylic medium with paint and use a knife blade to apply it to your lead, so that your pencil is thick with flat sides like a standard flat carpenter's pencil. Shape the lead point so that it is flat on both sides as well. Use a thicker piece of lead for carpenter's pencils than you would use for regular pencils to add to the realism. Make pencils with erasers - to make miniature pencils with erasers, use air dry or polymer clay to roll tiny balls, just slightly smaller than the end of the pencil. Set the pencil on a tile or other flat clean surface, and press the polymer clay to the end of the pencil. Roll the pencil and clay so they are the same thickness. Use a clay blade to trim the clay to length. Bake the polymer clay 'erasers' and glue them to the end of your pencil, or alow air dry clay to dry and then glue it in place. To create the metal band that holds the eraser to the end of the pencil, apply a thin coat of gold or brass paint to the base of the eraser / top of the pencil. Allow to dry. Make Pencils With Toppers - to make tiny pencils with toppers, make small, simple toppers from polymer clay and press them over the ends of the pencil. Allow the polymer clay to cool and harder, and remove it gently from the end of the pencil. 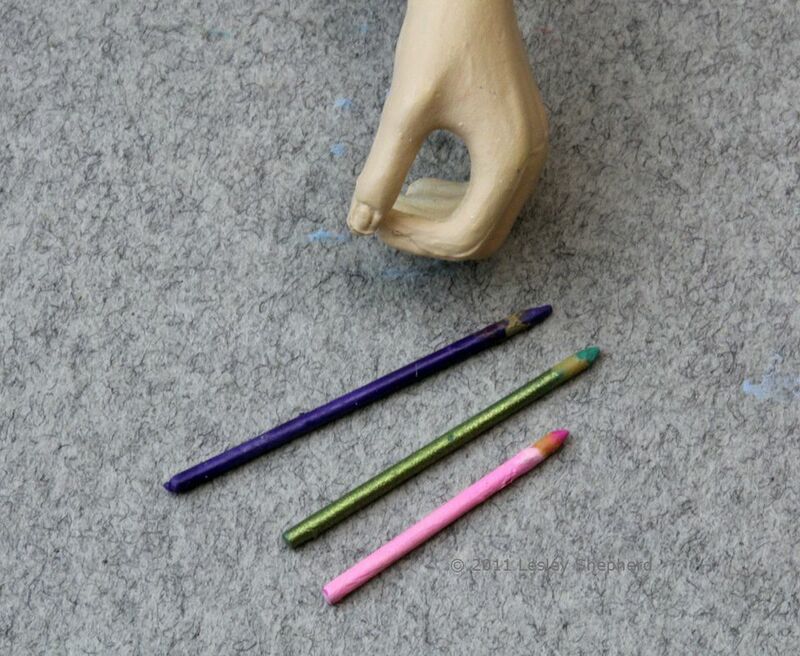 Bake the clay toppers, then glue them back in place over the end of your miniature pencils.